It's a Jazz Thang: T.J. Kirk's soul-jazz tributes are funky fun. THE PREMISE is deceptively simple. Toss funk-drenched dance grooves, hard-bop improvisations, and assorted experimentation into a musical Cuisinart to create a hip funk/jazz hybrid based on the prodigious influences of three musical giants. 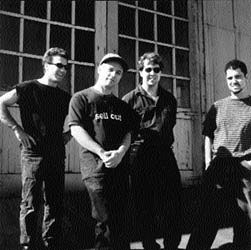 But the Bay Area quartet T.J. Kirk--guitarists Charlie Hunter, John Schott, and Will Bernhard, plus drummer Scott Amendola--never banked on this side project leading to a major label deal, critical raves, and national tour dates that would divert them from their own ambitious solo projects. First, let's explain that unusual moniker. The "T" is a tribute to bebop legend Thelonious Monk; the "J" is a big soul shout for funkmeister James Brown; and the "Kirk" refers to theatrical reedman and postmodern jazz explorer Rhasaan Rolan Kirk, who used to play several wind instruments simultaneously. "The vibe is funky, outside, and harmonically rich," Guitar Player opined about the band's 1995 eponymous debut. It's really like putting your head into a blender--that's how Schott describes the band's oddball approach. "Actually, I stole that phrase from Ted Nugent," he laughs, during a phone interview from his Berkeley home. "We wanted to take these three composers and have them bounce off of each other in a conversation," he explains. "You know how people are always saying, 'If you could have a dinner party and invite three people, who would you invite?' Some people might say, Einstein, Socrates, and Aretha Franklin, or something. "The idea here is a musical conversation between three great composers in which their compositions interpenetrate each other to create a dialogue." Typically, T.J. Kirk may lay down a James Brown groove and add a Monk song altered with Kirk's eclectic signatures. For example, their "Meeting at Termini's Brilliant Corner," from their recent, second disc If Four Was One (Warner Bros.), blends Brown's "I've Got a Bag of My Own," "Brilliant Corner" by Monk, and "Termini's Corner" by Kirk. "So by the end of the performance, you have all these elements swirling around," Schott says, "and their individual identities as compositions are broken down into fragmented motifs with their sources almost obscured." ASK SCHOTT about the band's decision to worship at the feet of this holy trinity and he waxes philosophical. For instance, here's what he has to say about Soul Brother No. 1 James Brown: "To me, he's yet one more incredible iconoclast musician along the lines of Charles Ives, Harry Parch, and Ornette Coleman." American classical composer Charles Ives? King of early-20th-century polytonality? "Yeah, Brown really invented a unique musical language," Schott observes. "He took elements of the vernacular that he found around--like the music of Hank Ballard and Jackie Wilson--and ultimately transformed that language into a very interesting and still quite misunderstood musical universe. I mean, both Brown and Ives used tonality in non-conventional ways that were almost a kind of quotation of tonality sometimes. "I don't want to get too technical, but if you listen to James Brown's music, there are really interesting things going on under the surface that often aren't fully appreciated." Appreciation also is coming slowly to the members of T.J. Kirk, though they're well known in contemporary jazz circles. Hunter, a eight-string guitar player who used to perform with the Disposable Heroes of Hiphoprisy, fronts his own power jazz quartet. Bernhard can be heard with the Peter Apfelbaum Sextet and recently was declared "criminally ignored" by the Detroit Metro Times. Schott, a Seattle native, released the 1995 solo album Junk Genius on the New York­based Knitting Factory label and debuted his 40-minute cantata In These Great Times last fall at the Lincoln Center for the Performing Arts. And Amendola lays down the beat for Hunter's own band and recently recorded The Oranj Symphonette Plays Mancini (Gramavision/Ryko) with the Philip Greenleif/Scott Amendola Duo. Will fame and fortune ever find T.J. Kirk? Schott remains stoic. "I think the new album will catch on," he says dryly, "though it may be 2013 before its contribution to Western musical culture is fully recognized." Is that bad? "No, I know our time will come and we'll eventually be seen as the latter-day Horaces that we are," he says. Then he adds, with more than just a touch of irony: "I just hope that inflation hasn't invalidated all previous contracts by then or that we're not all being paid in forget-it-all tablets." T.J. Kirk performs Sunday, Jan. 19, at 8 p.m. the Mystic Theater and Saloon, 21 N. Petaluma Blvd., Petaluma. Tickets are $8. Call 765-6665. Copyright © 1997 Metrosa, Inc.